Can I give vaccinations to my own horses? While most vaccines are available for purchase at feed stores, veterinary bulk supply outlets and other companies, these are not considered a reputable source. These stores usually do not guarantee proper handling of these products, so if you administer these vaccines, your horse might not receive adequate immunization for the particular disease. Vaccines carried and given by veterinarians come from a reputable source, with a guarantee that they were properly handled, distributed and stored at correct temperatures. Vaccine manufacturers stand behind their vaccines only when they were given by a licensed veterinarian. This is important in case a vaccine reaction occurs or the animal comes down with the disease. Also, if your horse is insured and it has a life threatening reaction to the vaccine due to incorrect injection technique, your insurance claim will be probably denied. One of the core vaccines, rabies can be administered only by a licensed veterinarian. This disease imposes great risk to public health and yearly rabies vaccination of every horse is strongly recommended by the AAEP (American Association of Equine Practitioners). What are some of the common signs of colic? If my horse may be colicking, when should I call a veterinarian? 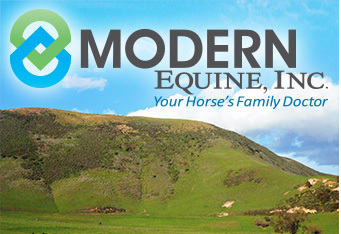 What causes laminitis or founder, and will my horse be okay? Acute laminitis might occur when the horse is subjected to severe stress, lameness, foaling, or systemic illness. One of most common reasons is overfeeding with grain and feedstuff with high sugar content. Sudden exposure to the lush green grass in the Spring and Fall can also be dangerous. Some horses are predisposed to laminitis such as ones with EMS (Equine Metabolic Syndrome, with abnormal fat deposits on the body, especially on the cresty neck) and horses with Cushing's disease. 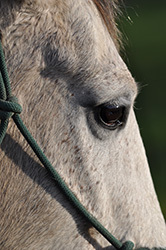 Clinical signs and treatment varies and depends on the horse and the severity of disease. If acute laminitis is detected early, full recovery is possible. Treatment includes adequate hoof support, frequent therapeutic shoeing/trimming, dietary and management changes, and anti-inflammatory medications. Monitoring the progress of disease with foot radiographs every 2-3 months is strongly recommended. My horse is bleeding from a wound and I don't know how to stop it. To stop or reduce the amount of bleeding, apply pressure by placing gauze on the wound and wrapping it with vet wrap. If this pressure bandage becomes blood soaked, DO NOT remove it, but apply another layer of gauze and vet wrap around it until your veterinarian arrives. If the wound is over an area where you cannot apply a wrap, place a gauze on the wound and apply manual pressure until the veterinarian's arrival. Can I use hydrogen peroxide to clean my horse's wound? No, unless you cannot clean it any other way and veterinary attention is not available. While hydrogen peroxide kills bacteria in wounds, it also kills healthy tissue. Wound cleaning is best performed with dilute iodine or chlorhexidine (Nolvasan) solution. If you are waiting for your veterinarian to arrive, the best is just to rinse the wound with cold water and wrap it so that it stays clean and doesn't dry out. Yes. If your mare has a healthy pregnancy, you should be able to ride her until she is at 200 days of gestation. Be sure to check the wellness program regarding foals.